Get perfectly, consistently spaced and centered shelf-pin holes! 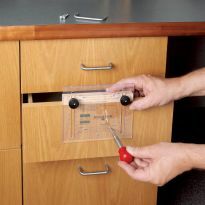 Economical and practical, this jig is ideal for adding shelves to assembled, unassembled, new, or existing cabinetry. Re-designed handle includes two storage compartments for self-centering bits! 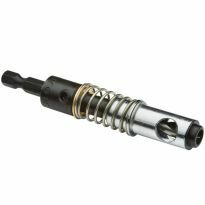 Additional Self-Centering Bit sizes available separately. Drills holes either 1-7/16" or 2-1/2" from edge. Insert shelf pin in top or bottom position to extend jig for continuous drilling. 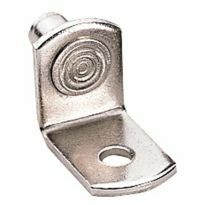 Provides exact set back for shelf pin holes of 37mm (1-7/16") or 64mm (2-1/2"). Included hex wrench is all you need to remove and tighten fixtures when repositioning handle for different applications. Clear template features laser cut accuracy. Designed for both face frame and frameless construction. Template system designed to work with 4 bit sizes: 1/4" and 5mm for shelf pins, 7/32" and 9/32" for pin sleeves. Determine setback required for your project: 2-1/2'' (64mm) or 1-7/16'' (37mm). Choose row depending on use: Face Frame or Frameless. Self-centering bits are pre-set to bore a consistent depth for perfect fitting shelf pins and sleeves every time. No adjustments are necessary! 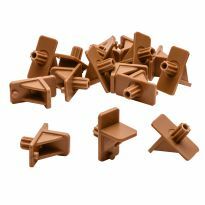 Various bit sizes available separately for both shelf pins and shelf pin sleeves. Decorative metal shelf pin sleeves provided added shelf strength. Very simple and accurate way to drill holes for movable shelves. I have used it on several projects with good results. First time I have used a tool like this. Easy as pie! Holes turned out in exact arrangement. Drill bit slid into holes in jig and made perfect holes for the pins. “Nifty” describes this jig best. Works exactly as it should. Has onboard storage for the bit and wrench to keep it all together. The bit worked flawlessly. It’s made a tedious chore simple. 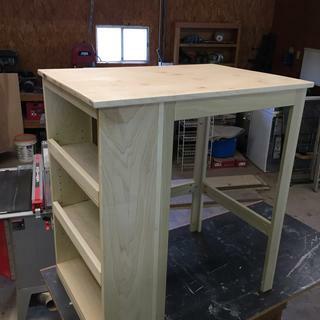 Wife wanted a 2nd dish cabinet like the 1st one i built. This one was made with the shelf centering jig with no frustration and no mis-aligned shelves. Just like all other Kreg Jigs and tools this shelving jig works perfect. We were building an entertainment center with adjustable shelving and needed this tool to perfectly drill the holes to match. The product came out perfect and very easy to use. Great. Made the job easy and fast. No struggling to level and duplicate measurements for the other side. The Jig It works great and the instruction schematics are correct, but I noticed in the photo that they are using the wrong set up for the frameless cabinet. 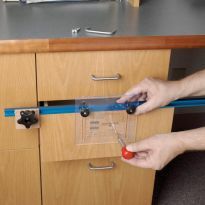 The guide bar is on the wrong side of the acrylic template for the holes to be in 1-7/16 inches from the front of cabinet. They way the Jig It is being used in the photo the holes would be about 1-1/2 inches from the front of the cabinet. I liked the jig and it saved me a great deal of time. It was easy to use and very accurate. I would definitely recommend it to anyone using this type of shelf support. This jig made the job way too easy. So easy I thought I was doing something wrong. I'll be using this jig again and again. Great product. Did the job. Matched up well with holes from a custom cabinet. It would be nice to have a narrow strip for custom made cabinets with the pin holes already drilled close to the back . Too close for the setback on this template. You could add a narrow strip to the jig. Worked as promised. I drilled almost 600 holes with it without any problems, Even for a smaller amount of holes it would have been worth the cost. Very good! Works as advertised! simple to use. all my friends borrow it. This jig saved me a lot of time and effort. Had 252 pin holes to drill and I knew that without a jig it wouldnt go well. My first one broke when we moved, and I kept it around long enough to use in a pinch, so when I started my cabinets in my shop, I ordered a replacement since I couldn't find the bit either. After I mounted the cabinet and started filling it, I came across an old coffee can and inside it was the original bit!! No rust! Still amazingly sharp. So now, I have 2 bits and one Jig IT that no cabinet maker should be without! Kudo's on the new design for storage. The last jig/bit I bought was trash. Bought this one and used it for 288 holes. The bit causes a little chipping (not too bad) but it was a pleasure to use - and pretty much foolproof. I'm very pleased with it. Perfect for adjustable selves in Dorm Refrigerator/microwave stand. Drill high speed setting gave perfect holes. Worked great. Used it on a 6 foot tall cabinet to add pantry shelves. Made lots of holes fast. Used it to drill holes in a bathroom cabinet I am building worked great and really Made the job easy and fast. Yes I would recommend it. Love it. Easy to use and quality material. Definite recommend it. Great product easy to use! Just make sure you are aligned before drilling opposite side. I've been usein this for years, can't do without it. Bought this as a replacement and a backup for the one I have. This jig works the first time and is very easy to use. 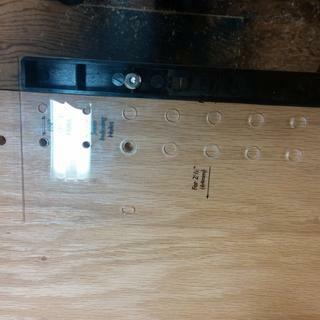 My job is made much easier by using Rockler Hardware jigs. I love this thing! Keep up the good work! This is a easy way to make shelf pins, works! It is easy to work with and makes quick, accurate work of this detail. Very easy to use especially with the drill bit included. My hand made jig got beat up and was hard to control depth. I thought I woud try this one (on sale) and it works great. 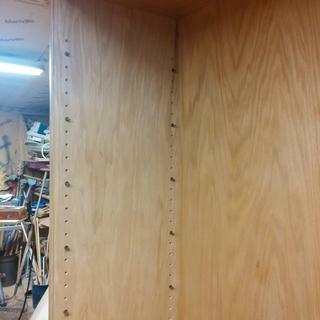 I needed to drill close to 200 holes for a 7 ft tall cabinet with 11 adjustable shelves. I looked at similar, smaller and even cheaper jigs, but for the job - this was hands down the best buy! I have multiple bits for it, for the pin holes with and without the sleeves. I knew I was only going to use this jig for closet organizer adjustable shelfs. 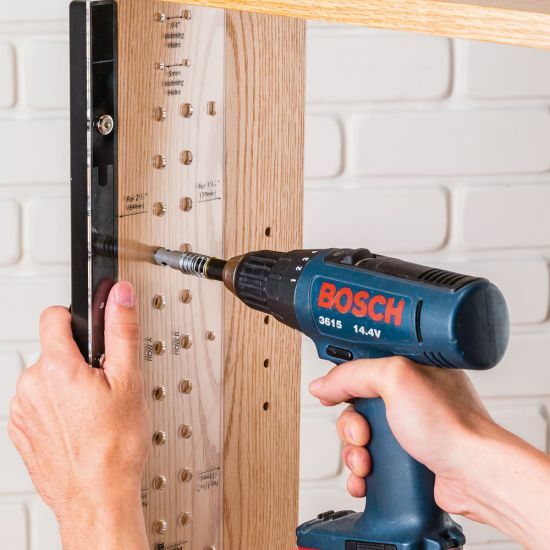 I was looking for a low cost fool proof way to drill a lot of shelf pin holes. This is doing the trick and is very easy to use. I clamp mine to the upright I am drilling so I can focus on the drill and bit. Works great with my cordless on high speed mode. The Insty bit hangs up sometimes with wood chips but clears easily when I cycle the depth stop a couple of times. Clean holes and no wear out yet after about 250 holes. I used one shelf pin to extend the jig when I ran out of holes in the template. Easy to set-up and use. Indispensable, love it! Great product, easy to use. Makes quick work of laying and drilling the holes. A perfect in-expensive solution for this layout work! This jig makes adjustable shelving quick and easy. I used to use a shop made jig made out of peg board with the same style self centering bits, but after build a few bookcases the small variation from square on my jig (roughly 0.004") and the fact that the holes in the peg board were not drilled perfectly on center led to misbalanced holes and crooked shelves. With this jig though, all those hassles are gone. 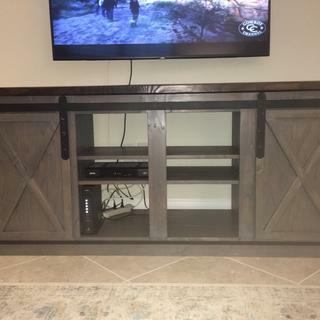 Was able to put the shelf pin holes on the side cabinets for my entertainment system and they came out perfectly. Jig IT saves the day, and time! Easy to use, precise, and makes short work of shelving peg holes. Don't even bother trying it on your own without it. Cuz I cant consistently drill a line of holes to save my life! Planning a project with shelving. Reviews seem to be very good for this jig. I read a review of five different jigs. This one was one of the ones that was recommended. Another which attracted my attention stopped when I learned it cost over $100. This is a bargain by comparison. Broke the one I have. Reviews were good and planing to build a shelf unit soon. Time saving and accurate. You can make your own, but it takes time and hard to get perfectly accurate. I have a storage project that requires ease of installation and a smooth professional finish. Learning how to build and work with wood. New hobby. Wanted to make sure I could make movable shelves. I preferred the see through design and materials choice of the jig. I also like the side handle which had storage capacity as well for the drill bit which was included with the price. I preferred this design over the Kreg design. Just what I was looking for, been using a piece of peg board before. I have a pantry with 1 inch stock as shelf supports. They take up too much room! Now I can use adjustable shelving. To enable my bookcase to be adjusted to fit any size book. Want to build my own adjustable Shelving Cabinet. Been needing one for an upcoming project and the timing was great. I have the Pro Shelf Drilling Jig and it is very good for shelving under construction but will not fit in existing cabinets. This Jig It will fit perfectly in existing cases. My first attempt to build a shelving unit and needed a tool to drill my shelf support holes. Want to make tool shelves for my garage. 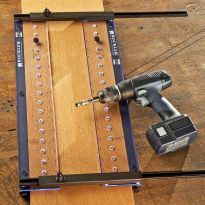 I purchased this product to speed up the process of drilling shelving holes for three different shelving configurations, all within different segments of one project. I previously owned one and left it with a friend 1,500 miles away. Needed it again. Great choice for new and retrofit work. Getting ready to build shelves that need to be adjustable and hope this works out better than a piece of pegboard. I have many projects to do . Needed to build a book case. I have alway had good sucesss with Rockler products. i had this product for about 15 years it finally broke. but is still 100% usable. Just wanted to a new one for my installs. What is the depth of the hole that the Insty Bit drills. 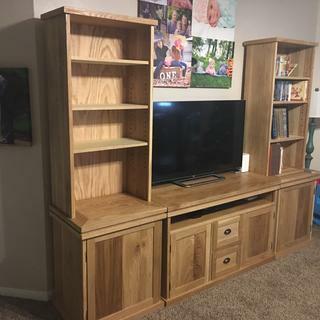 I use an import plywood for the sides of my cabinets which is only 15/32'' thick and don't want to drill through the finished side? The depth is preset for standard shelf pins and is also adjustable too. 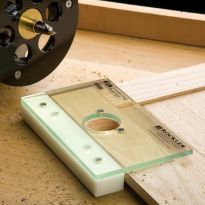 Is this self-centering bit made for Rockler by Insty Bit? What is the size of the jig hole or the outside diameter of the self centering bit sleave? Is it 3/8" or a different diameter? 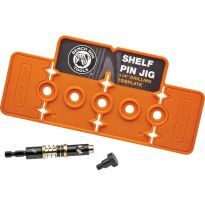 Does the jig plus bit combo come with a Rockler Insty bit or another brand of self-centering bit? I subsequently ordered for 5mm holes also was an Insty bit. 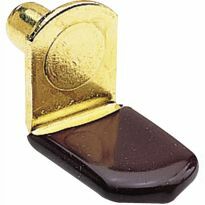 There is a "step" on the bottom of the bit which is 3/8 inch which fits into the hole. Did not measure the outer diameter of the bit housing as the step ensures that the bit is centered. Hope this answers your questions. I got an extra just so I wouldn't be done any. What are the dimensions of the jig itself? Need to make sure it will fit into the existing cabinet to which I'm adding shelves. Does anyone make a self-centering bit for this jig that drills 7/64" (2.8mm) holes for the euro-style shelf pins? BEST ANSWER: If you have the 5mm assembly it will only take 5mm bit so you have to get the whole 9/32" set. The 9/32 & 5mm bits are sold seperately as a replacement. 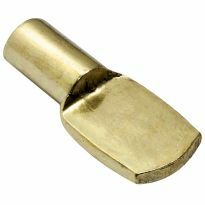 Buy a 9/32 in self centering bit. What is the space center to center of the holes? What is the thickness of the jig and how wide is it ? BEST ANSWER: Thr jig is 5" wide. The thickness of the actual jig is 1/8", but the thickness of the fence is 1 1/8". The fence moves from side to side depending on how you use the jig. The fence also has storage for two bits. Since the fence works with either 1/4' or 5mm bits, this is good. I originally bought the 1/4" bit, but later also bought the 5mm bit because my local hardware store has a larger selection 5mm shelf supports. Hope this helps. The thickness of the clear acrylic is 1/8 inch. The over all thickness including the black rail is 7/8 inch. The width is 5 inches the black rail is 1 inch wide. Hope this helps. I would like to use this jig, but don't like the "slop" that can be introduced with using shelf pins to extend the drilling length. Can indexing pins item number GRP40497 be used with this jig?